The Lovecraft Squad: Waiting will be out this Halloween with stories by myself, Brian Hodge, Reginald Oliver, Michael Marshall Smith, Steve Rasnic Tem, Peter Atkins, Richard Gavin, Jay Russell, Thana Niveau, Stephen Baxter and Kim Newman. Cover art by Douglas Klauba. 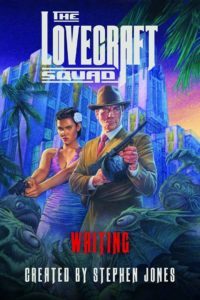 This entry was posted in News and tagged brian hodge, Jay Russell, kim newman, michael marshall smith, Pegasus Books, Peter Atkins, Reginald Oliver, Richard Gavin, Stephen Baxter, stephen jones, Steve Rasnic Tem, Thana Niveau, The Lovecraft Squad: Waiting. Bookmark the permalink.